The S&P 500 Index flirted with a correction Monday as all of its main groups tumbled. U.S. stocks dropped, with the Standard & Poor’s 500 Index flirting with a correction, as a selloff in global equity markets deepened. All of the benchmark index’s main groups tumbled, with raw materials shares approaching a two-year low while energy companies slumped to the lowest since October 2011. Citigroup Inc. and JPMorgan Chase & Co. fell at least 3.1 percent as banks retreated the most since March. The S&P 500 slid 2.2 percent to 1,928.22 at 10:53 a.m. in New York, with the benchmark down 9.6 percent from its May all- time high. The gauge pared a drop of as much as 5.3 percent. 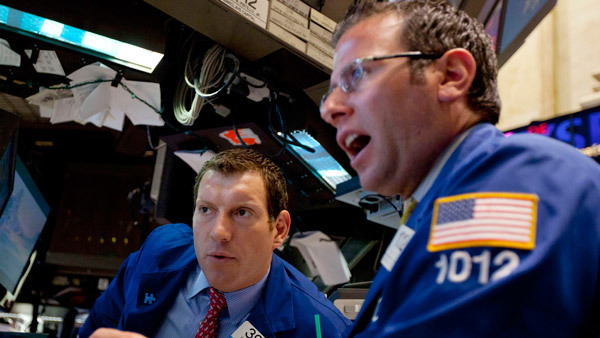 The Dow Jones Industrial Average lost 337.96 points, or 2.1 percent to 16,121.79. The Nasdaq Composite Index slid 2.1 percent to its lowest since February after earlier losing as much as 8.8 percent. The Chicago Board Options Exchange Volatility Index jumped 32 percent to 36.90, trimming an earlier 90 percent surge that temporarily sent the gauge to its highest level since January 2009. Calm in the U.S. market shattered last week, with volatility soaring by the most on record as the Dow entered a correction and investors dumped the biggest winners of 2015. A gauge of volatility expectations more than doubled last week. Shares succumbed to a global selloff that’s wiped more than $5 trillion off the value of equities around the world since China’s shock currency devaluation on Aug. 11. Moreover, speculation had been building all year for the Federal Reserve to raise interest rates in September for the first time since 2006, following the end of quantitative easing in 2014. Traders are now pricing in less than a one-in-four chance the central bank will act next month, from about 48 percent just before the yuan devaluation, as the rout in equity markets has shaken confidence that the global economy will be strong enough to withstand higher U.S. rates. he most since 2011 on Friday amid signs China’s economy is weakening. A gauge of volatility expectations more than doubled last week. The S&P 500 is on track for its worst August decline in 17 years. It sank the most since 2011 on Friday amid signs China’s economy is weakening. A gauge of volatility expectations more than doubled last week. Despite the selloff, the benchmark index has avoided the corrections and bear markets afflicting stocks from Sao Paulo to Shanghai. It was only Friday that the S&P 500 capped its single 5 percent decline of the year, spending the previous seven months locked in a trading range that had no precedent in a century of market history. The retreat in global stock markets bears resemblances to losses that hit equities in 1998, when financial stress from Asia to Russia sent the S&P 500 down 19 percent, only to recover in three months, said Laszlo Birinyi, the president of Birinyi Associates in Westport, Connecticut. –With assistance from Adam Haigh in Sydney.